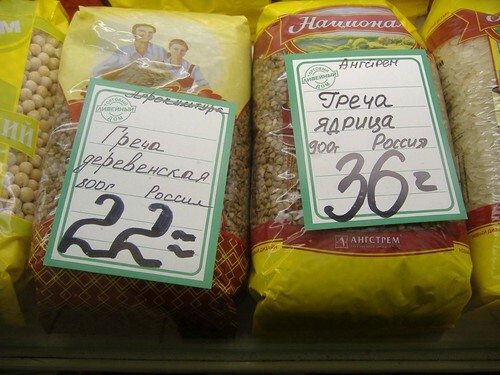 Another food shortage has hit Russia. Recent droughts have caused a shortage in the availability of buckwheat. Citizens are growing restless, and the last thing the government needs is restless, hungry people on its hands. This isn’t a scene out of imperial Russia in the early 1900s or the Soviet Union in the 1980s – this is The Great Buckwheat Shortage of 2010. Young Russians are now seeing their parents act in ways they’ve never seen before. Older generations, fearing the shortage will only get worse, are reverting back to Soviet era tactics. It’s odd to think of an entire country running out of a staple. In this age of the global economy and planes, trains and automobiles – can’t they just stop by their local supermarket and pick some up? Imagine Wal-Mart, Hy-Vee and Target all running out of corn. I just can’t. Turns out while it’s a bad time to be a buckwheat eating Russian citizen, it’s an even worse time to be a supermarket chain in Russia. According to this blog, French chain Carrefour pulled out of Russia last fall, and other chains are hesitant to take a gamble on Russia’s troubling economy. While a successful chain would see large gains in the otherwise untapped Russian culture, entering the market would require some big risks. After some digging, I did find evidence of some supermarkets doing business in Russia – Kopeyka, Lenta and Spar to name a few. Googling Lenta brings up a Reuters article regarding everyone’s favorite supermarket, Wal-Mart. Turns out they have their eye on Russia. But even giant corporations like Wal-Mart aren’t going guns blazing into the Russian economy. “We’ll make a decision when it’s the right time and we have the right entry opportunity and not before then,” said Doug McMillon, Walmart International’s president and chief executive. According to an earlier Reuters article on the topic, the chain isn’t just interested in buying a stake in Lenta. They want it all. “If they (Wal-Mart) did a deal, they would buy the whole thing,” one financial source said. Why can’t the chain just head into Russia and start from scratch? Apparently that’s just not how the business works anymore. Chains would rather buy existing structures (which while readily available in countries like the US, are not in Russia), than build ones from scratch. It costs too much money to build a new brand and infrastructure. For the Russians who have heard about Wal-Mart’s terrible practices, don’t worry. If Wal-Mart decides to go full steam ahead in Russia, you’ll be sure to have other options. Because you can bet Hy-Vee will be there, setting up shop right next to every Wal-Mart that goes up. This entry was posted in Culture, Russia and tagged civil disorder, economics, Food, Russia.